Since little is known isolate a sheet of carbon-graphite one atom thick. This crystal is two-dimensional graphene has remarkable electronic transport properties, which are neither those of a metal nor those of a semiconductor.In this paper we have developed a novel structure electromagnetic bandgap (EBG), with a periodic arrays of carbon nanotubes presented,by introducing a multiwalled carbon nanotubes like a metallic viaholes. The electromagnetic bandgap (EBG) surface, also referred to as a photonic bandgap (PBG) surface, has attracted extensive studies, In the optical domain , microwave and millimeter-waveareas.The method used is an integral method based on the concept of waves (WCIP). Belkadi N., Djelloulib B., Douara A., Rabehi A., Ziane A. 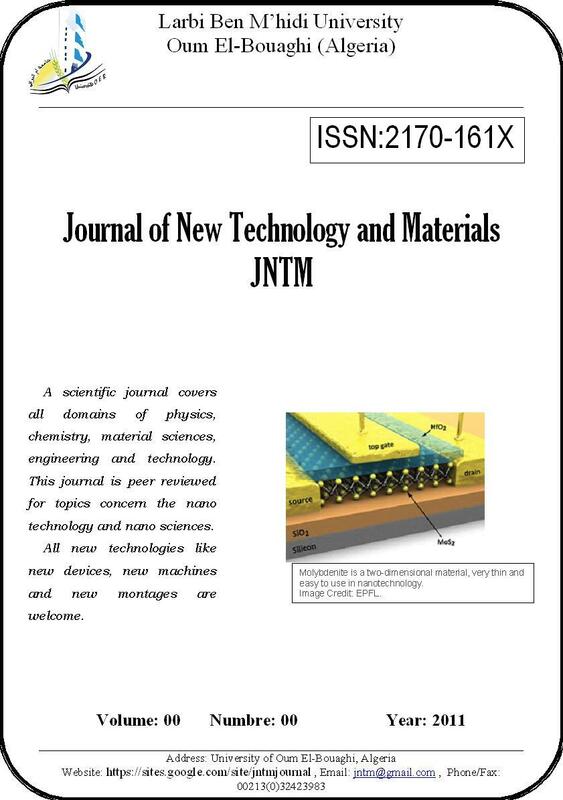 We report some results the drain current characteristics of AlGaN/GaN HEMT(High Electron Mobility Transistor). on are simulated by changing the different device parameters such as Al content x and the barrier thickness for different values of the gate voltage using Tcad-Silvaco numerical simulation software. Drift–diffusion model has taken for simulating the proposed device. we use SiC as a substrate for this structure, The channel is made of GaN and source-drain spacing is 1 μm. Bouchekouf S., Kbailli F., Marir A., Merzougui A. In this paper, we report on investigation uses a method of calculation the photocurrent delivered by the organic solar cell double-layer MPP/ZnPc applying the equations of continuities and the currents by analogy to the phenomena of loads transport according to the model of an heterojunction n/p. The principal generation of the photocurrent is localized in the active zone, a very fine area by contribution with the thicknesses of the donor and acceptor layers. Thus let us that the excitons dissociate only in the MPP/ZnPc interface, whereas the zone of absorption is considerably larger than the diffusion length. The principal photovoltaic parameters of this structure are calculated by the simulation of equation I(V), under illumination AM1. 5. Insertion of the composite layer C60 and ZnPc in the interface of MPP and ZnPc makes it possible to improve the performances of the cell by an increase in the photocurrent of the value 2.6 mA/cm 2 to 5.3 mA/cm 2 and the conversion efficiency η from 0,72% to 1,49%. We worked out a numerical model based on resolution of equations of continuities who gave results in good accordance with literature and which allowed, moreover a better control of performances of organic cells, for their improvement. Bazine A., Ferah M.S., Sedira N.
Thin Hematite iron oxide layers ( Fe2O3) were synthesized successfully using FeCl3 as precursor, ethanol as solvent and acetic acid as catalyst according to the sol-gel process and spin-coating technique. The structural properties of the films were investigated by X-ray diffraction (XRD), scanning electron microscopy (SEM) and Raman spectroscopy, and optical properties by the UV-Vis spectroscopy. This study shows a singular behavior of optical transmission characterized by two bearings and a clear dependence of optoelectronic parameters with film thikness. Azizi Ch., Mellal S., Zaabat M., Ziar T.
A two-dimensional numerical analysis is presented to investigate the field effect transistor characteristics, Our main aim in these sheet related on the one hand to the optimization of a two dimensional (2D) analytical model for the static characteristics of short gate-length GaAs MESFET‟s, this model takes into account the different physical specific phenomena of the device, and on the other hand to study the influence of the effect edge on the variation of some intrinsic elements (transconductance and drain conductance). The model suggested has enables to us to calculate and trace the different series from curves. The results obtained are well represented and interpreted. The objective of this study is to determine the characteristics of soot (size and distribution) in a laminar flame of diffusion(ethylene_air).The non intrusive technique used is the incandescence induced by laser (LII) discovered by Melton. validated by experimental measurements and confrontation with various powers of the exiting laser ,the result is satisfactory. Boukaous Ch., Ghanem S., Telia A. Present work deals with deposition of Zinc oxide (ZnO) thin films by sol-gel method. Sol was prepared using zinc acetate, 2-Methoxyethanol and monoethanolamine (MEA) as starting materials. Films were grown using spin coating method and annealed at 500◦C. ZnO films morphology was investigated by Scanning Electron Microscope. SEM images reveal that films are composed with wrinkles network. Crystalline structure was studied by means of X-ray diffraction analysis. XRD patterns exhibit three strong peaks (101), (002) and (100) planes assigned to Wurtzite structure. The obtained results for electrical properties were reported. Relative humidity sensing properties has been studied and determined by variation of electrical resistance measurements at various humidity levels. Our experimental results show that the temperature and morphology have strong influence on the response and recovery times of sensing. Abdelmalek N., Allouane D., Hadjeris L., Herissi L., Moualkia H., Rahmane S.
We present the influence of Fe-doping (2%, 3% and 4%) on ZnO thin films. For this purpose, structural, electrical and optical proprieties have been investigated by X-ray diffraction, 4-points technique and UV-Visible spectrophotometry. The ZnO:Fe thin films have been deposited by pneumatic spray pyrolysis on glass substrates at different temperatures (350, 400 and 450°C) and fixed molarity (0.1mol/l). The precursor solution is a mixture of zinc acetate dihydrate (Zn(CH3COO)2, 2H2O) and iron chloride hexahydrate (FeCl3, 6H2O) dissolved in bi-distilled water. The X-ray diffraction (XRD) analyzes show that all the prepared thin films have a polycrystalline structuredominated by (100), (002) and (101) textured orientations. A resistivity of 2.9 10-2 Ω.cm was found for films deposited at 450°C with an iron rate of 3%. The average transmittance was found to be in the range of 45-70% for the different doping rates. The optical band gap energy of the films was found near 3.3 eV.